You must understand, whoever you are, that in those days Rome, mistress of half the world, was a place as savage as a village of Nile pygmies. Thus providing employment for our narrator, one Decius Caecilius Metellus, young commander of what passes for local law enforcement in his district of the city of the seven hills, circa 70BC. As John Maddox Roberts’ The King’s Gambit begins, someone is committing arson and garroting manumitted gladiators and rich freedman in Rome. In a plot that moves from simple murder to outright treason and threatens his own life, Decius’ investigation takes him into a Senator’s sister’s bed, to a brushing acquaintance with pirates (those same pirates who betrayed Spartacus, and here we find out why) all the way up to the Senate, including its two Consuls, Marcus Licinius Crassus and Gnaeus Pompeius Magnus. Hortalus gave very florid speeches, in what was known as the Asiatic style. He wrote the same way…Such writing reads very strangely now, since Caesar’s bald and unornamented yet elegant style revolutionized Latin prose. Between them, Caesar’s books and Cicero’s speeches utterly changed the language as it was taught in my youth. From each shop front and storehouse came the fragrances of the whole Mediterranean world. Incense and spices were stored here, and rare, fragrant woods. The odors of fresh-sawn cedar from the Levant and pulverized pepper from even farther east mingled with those of frankincense from Egypt and oranges from Spain. It smelled like Empire. Decius is an engaging character, not the ambitious social climber you’d expect from a young Roman on his way up, but a good man whose motivation to solve these crimes, as he confesses to his vestal virgin aunt, comes from not wanting to see innocent slaves crucified in lieu of the actual murderer. Yet another true detail of soon to be imperial Rome that will make you glad you’re enjoying this story in a comfortable chair in your living room two thousand years later, and not living through it yourself. Hi Dana, I ordered Second Star for myself, but my husband saw the audio CD’s and listened instead. He loved it. 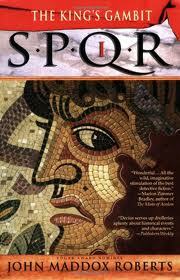 Thanks for the review on this series of books about Roman life. I have been listening to all of your books and am so used to having Marguerite Gavin’s voice in my ear. Good luck and enjoy your trip. Can’t wait for the Silk Road book to come out. The stars are obviously aligned, because I just started rereading this entire series from the beginning. I have a weakness for Roman mysteries, and this is one of the best.